La poutine et sa propre Polka! Musically, the Dreadnoughts travel where many fear to tread, embracing a huge range of European folk traditions. For proof, look no further than their new release, « Polka’s Not Dead ». This recording is strewn with polkas, gypsy dances and sea shanties, each infused with the raw energy of street punk. 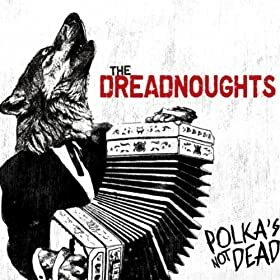 The Dreadnoughts take folk tradition seriously, and they take punk music seriously, and « Polka’s Not Dead » is their definitive statement.